This delicious chocolate hazelnut cake recipe is simple and elegant. I've tried some European cakes that featured ground walnuts and had a delicate, if somewhat dry, composition, so I expected this chocolate hazelnut cake recipe to produce something a little austere. Well, was I surprised! This cake is downright indulgent, and not dry at all, nor is it dense (nor is it very European...too sweet for that). Hazelnutty, moist, and chocolatey ... it was just right. 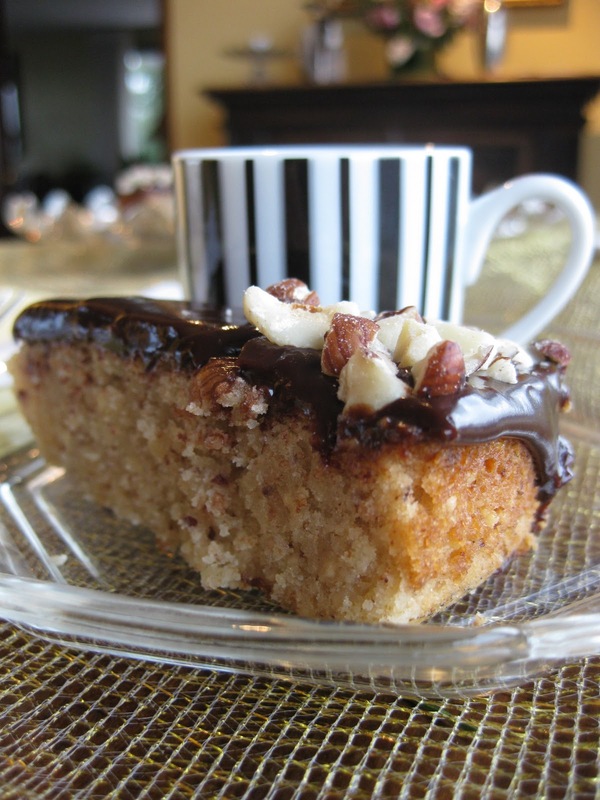 This brown hazelnut butter cake recipe makes a delicious coffee companion. What makes this cake stand out compared to other similar recipes is the browned butter. It amplifies the nutty flavor of the cake's toasted hazelnut flour. Only discerning tasters can figure out what secret ingredient is giving it that depth of flavor, and to everyone else it just tastes so good that they don't care what's in it. Just be careful not to burn the butter when you are trying to brown it. If you do burn it, just discard the overcooked butter and try again. Or wait for your discerning tasters to ask you what type of charcoal gives the cake that "special flavor." Espresso goes well with this tasty chocolate hazelnut cake recipe! It's fun to make recipes that require whipping egg whites because of the transformation they undergo: and this is one of those recipes. Health advisory for those who don't have a mixer with a whisk attachment: If you value your arms, then I don't recommend making this recipe. If you try to whisk the egg whites sufficiently by hand, you may not have arms by the end of your cruel experiment. But,at least you might have a cake, and maybe a friend could feed it to you. Spread hazelnuts on a baking sheet and toast until golden brown and fragrant, 12-15 minutes. Remove hazelnut skins by placing a handful of roasted hazelnuts onto one half of a clean dishtowel: cover them with the other half of the dishtowel and roll them around. Friction from the dishtowel should make most of the dark hazelnut skins come off. It doesn't work perfectly, but it works well enough and is a very low-effort method. Brush the bottom of a 10-inch round cake pan or springform pan with some melted butter, and line with parchment paper. In a medium saucepan, add the rest of the butter. Cook until the butter browns and smells nutty (6 to 8 minutes), frequently scraping the solids off the bottom of the pan to ensure even browning. Remove from heat. Add vanilla extract to the mixture at this point. Once the hazelnuts have cooled, grind them finely with the confectioners’ sugar in a food processor. Add the flour and pulse to combine. Place the egg whites in the bowl of a stand mixer fitted with the whisk attachment. Add the granulated sugar and mix on high speed 4 to 5 minutes, until the mixture forms very stiff peaks. When you turn the whisk upside down, the peaks should hold. Transfer the whites to a large mixing bowl. Alternate folding the dry ingredients and the brown butter into the egg whites, a third at a time. Pour the batter into the cake pan and bake for 35 to 50 minutes. Allow to cool on a rack for 30 minutes. Run a knife around the inside edge of the pan and invert the cake onto a plate. Peel off the parchment paper lining, and voilà! Melt the chocolate, heavy cream, and instant coffee powder in a double boiler until smooth, stirring occasionally. Pour over the brown butter hazelnut cake and spread with a knife if needed. Great to see you yesterday, and good luck with your culinary/artistic explorations! Hope to see you again soon.